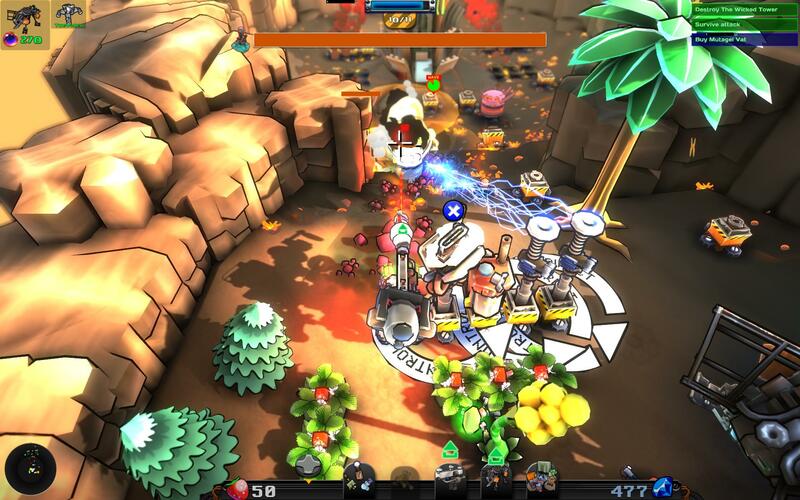 Released Reviews Steam Written By: Jonathan A.
McDROID is one of the two most imaginative tower defense games I’ve played in a long time. It’s a timeless story about you (a puppy-like robot named McDROID) and your friend SHUTTLE crash-landing on the dying Planet M. You must plant and harvest strawberries as a form of currency to build and upgrade towers to fight off the corrupted creatures that have taken a stronghold on Planet M. This may really sound strange, but it’s also a truck load of fun! Maintaining your calm, like John Spartan, is crazy essential to McDROID. If you don’t keep a clear head you’ll start forgetting to maintain your defenses so you can gather stuff or you’ll forget about gathering strawberries and have nothing to buy towers with. Things can go from good to “Oh sweet mother! Where did all THAT come from!? !” fairly quickly. That’s part of the strategy/challenge though. Since the game comes off as having a tower defense game foundation one can assume a usual set of rules: set defense->kill monsters->gain money repeat. McDROID rarely gives you the currency needed to buy towers or to beef them up from drops (while in the stage). You need to find and plant seeds to grow your strawberries. You’ll usually start with a few seeds and then get more from monsters to plant later. Then, not only do you have to pick them when they ripen, but you also have to take them to SHUTTLE. Then you can spend them on defense. Also, you can only carry a certain amount at one time. All this takes time away from the front lines of battle. You’ll quickly learn that if you ignore the front line for too long in hopes for more profit, the front line will be in your face in no time. Eventually you’ll get blueprints for a gathering tower the helps by harvesting strawberries and gathering diamonds nearby. Don’t scoff at the idea like I did; use this helpful tower! Need more diamonds… need bigger guns! Of all the things that the bad guys do drop, you will receive diamonds from some of them and these are essential. High scores… screw’m. You can come back later for that. Diamonds help a lot more in the long run. They are used in the researching of bigger and badder guns to help repel the waves of no-goodniks. Oh, I guess you could also buff your defenses too, but isn’t the best defense a good offense? That does come with a cost though. 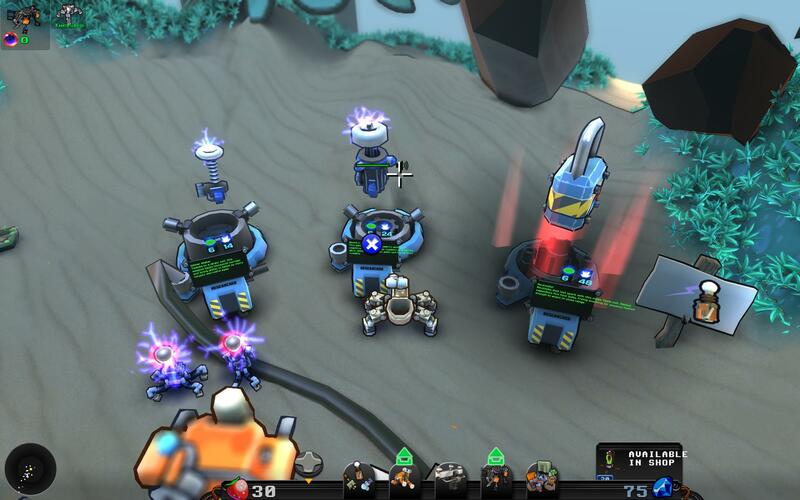 If you unlock all four levels of your laser turret, you may only be able to have one fully upgraded turret instead of multiple lower end ones. Is that worth it? It varies on each situation. 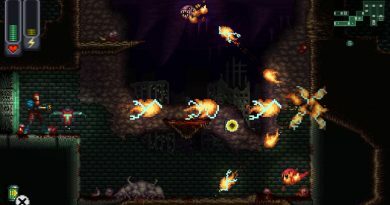 Sometimes the upgraded turret can function differently than the previous levels and you may not even like it! Spend you diamonds carefully… or not really, you can always get more! 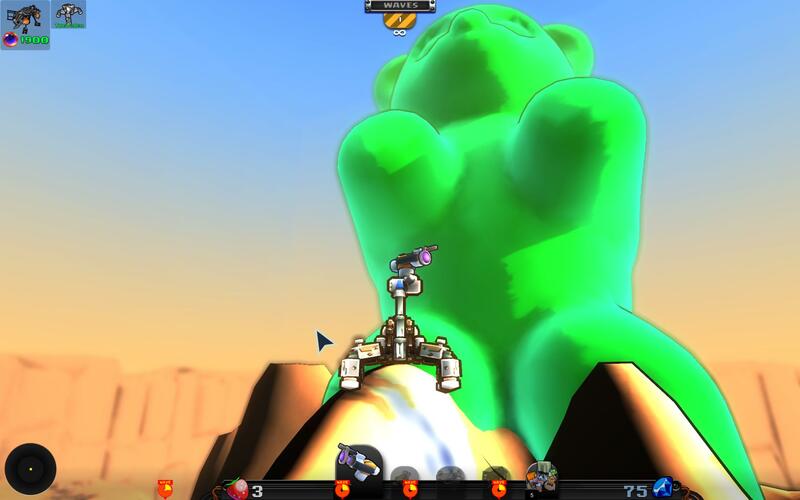 Why yes that is a picture of McDROID standing in front of a giant green Gummy Bear. Why? What did you think it was? Something else that stands out in McDROID is the humor. It’s… strange. Not the “so far out of left field you can’t fathom it” strange, but you will probably tilt your head and question if you just heard what was said. It’s nothing inappropriate, just different. Some of the things said in McDROID also had me rolling. This is a light-hearted title that holds a crowbar behind it’s back. One minute it will have you laughing and the next the sudden change in a battle’s tide will have you crying. One of the best parts of McDROID is the coop. Normally this is something that is just tacked on for me and is nifty, but not all together necessary for me to have a good time. While single the single player campaign is great fun, playing this crazy madness with friends is simply a blast! It can be a bit confusing at first with the strawberry collection being shared and one teammate (read: me) spending all of them on some venture that he thinks is a great idea. Hopefully it pays off, but it won’t 100% of the time. Diamonds collected go to each individual person, but when spent only get taken from the one who purchased said item. It’s a very nice touch. Other than a small issue with the back button on my controller causing some problems, McDROID is a delight to play with or without friends. The concept is great and executed fantastically. It’s not super deep, but it’s got depth where it needs it. If you are a fan of strategy/tower defense games, you owe it to yourself to pick this up and give it a try. It may not be a walk in the park, but there are some nice views to take in while your rampaging across Planet M.
(Review) A Robot Named Fight! All the colors make me hungry for candy for some reason. Hungry for some McDROID amiright? Sorry, my comment is so late. I’ve been busy playing McDROID. This is one of the most funny games I’ve played in years. When I’m tired and not thinking, I play a level I’ve done before to build up my diamonds to do research. When I’m ready to think and react, I invest diamonds to build infrastructure on the easy mode of each level in order to be able to use that infrastructure on the harder modes. Do I really want a dozen puppies following me around firing missiles? Yes. Yes. I do.